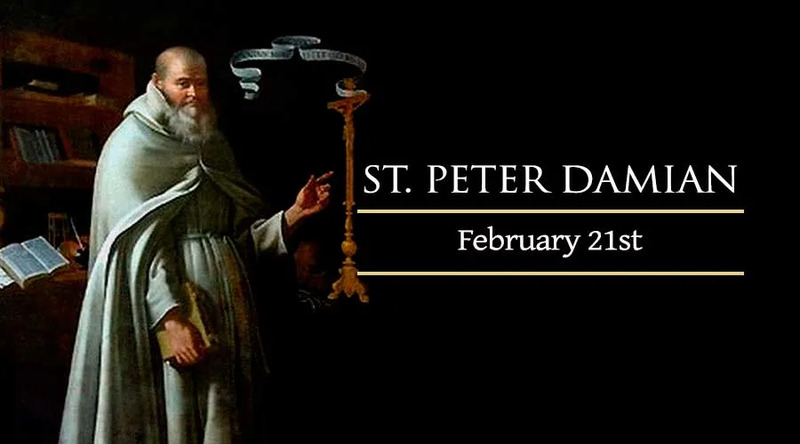 On Feb. 21, Catholics honor Saint Peter Damian, a Benedictine monk who strove to purify the Church during the early years of its second millennium. In his Sept. 9, 2009 general audience on the saint, Pope Benedict XVI described him as "one of the most significant figures of the 11th century ... a lover of solitude and at the same time a fearless man of the Church, committed personally to the task of reform." Born during 1007 in the Italian city of Ravenna, Peter belonged to a large family but lost both his father and mother early in life. An older brother took the boy into his household, yet treated him poorly. But another of Peter’s brothers, a priest, took steps to provide for his education; and the priest's own name, Damian, became his younger brother’s surname. Peter excelled in school while also taking up forms of asceticism, such as fasting, wearing a hair shirt, and spending long hours in prayer with an emphasis on reciting the Psalms. He offered hospitality to the poor as a means of serving Christ, and eventually resolved to embrace voluntary poverty himself through the Order of Saint Benedict. The monks he chose to join, in the hermitage of Fonte Avellana, lived out their devotion to the Cross of Christ through a rigorous rule of life. They lived mainly on bread and water, prayed all 150 Psalms daily, and practiced many physical mortifications. Peter embraced this way of life somewhat excessively at first, which led to a bout with insomnia. Deeply versed in the Bible and the writings of earlier theologians, Peter developed his own theological acumen and became a skilled preacher. The leaders of other monasteries sought his help to build up their monks in holiness, and in 1043 he took up a position of leadership as the prior of Fonte Avellana. Five other hermitages were established under his direction. Serious corruption plagued the Church during Peter's lifetime, including the sale of religious offices and immorality among many of the clergy. Through his writings and involvements in controversies of the day, the prior of Fonte Avellana called on members of the hierarchy and religious orders to live out their commitments and strive for holiness. In 1057, Pope Stephen IX became determined to make Peter Damian a bishop, a goal he accomplished only by demanding the monk's obedience under threat of excommunication. Consecrated as the Bishop of Ostia in November of that year, he also joined the College of Cardinals and wrote a letter encouraging its members to set an example for the whole Church. With Pope Stephen's death in 1058, and the election of his successor Nicholas II, Peter's involvement in Church controversies grew. He supported Pope Nicholas against a rival claimant to the papacy, and went to Milan as the Pope's representative when a crisis broke out over canonical and moral issues. There, he was forced to confront rioters who rejected papal authority. Peter, meanwhile, wished to withdraw from these controversies and return to the contemplative life. But Nicholas' death in 1061 caused another papal succession crisis, which the cardinal-bishop helped to resolve in favor of Alexander II. That Pope kept the Cardinal Bishop of Ostia occupied with a series of journeys and negotiations for the next six years. In 1067, Peter Damian was allowed to resign his episcopate and return to the monastery at Fonte Avellana. Two years later, however, Pope Alexander needed his help to prevent the German King Henry IV from divorcing his wife. Peter lived another two years in the monastery before making a pilgrimage to Monte Cassino, the birthplace of the Benedictine order. In 1072, Peter returned to his own birthplace of Ravenna, to reconcile the local church with the Pope. The monk's last illness came upon him during his return from this final task, and he died after a week at a Benedictine monastery in Faenza during February of that year.